Within Bangladesh’s social structure, survivors of human trafficking are especially vulnerable. Often, they are stigmatized within their own families and communities. In order to restore their confidence and place in society, the Winrock-implemented Actions for Combating Trafficking-in-Persons (ACT) program empowers survivors to claim their rights and be important social actors in preventing trafficking and protecting other survivors. To this end, the USAID-funded ACT program has developed “Survivors’ Voice” groups named ANIRBAN (“the flame that will not fade”), which are made up of trafficking survivors. These survivors chose their own group names and decided they would serve as a community resource; as advocates to address survivor protection issues at the community level; and as mentors and participants in developing and providing services to other survivors. 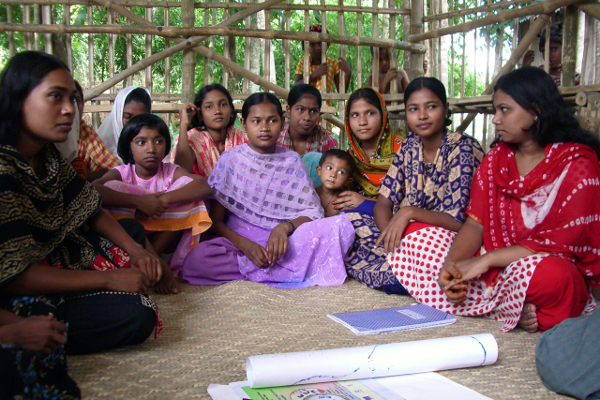 ANIRBAN groups have taken the lead in building their own self-confidence and group identity, raising awareness about human trafficking and advocating for survivors and their rights. The groups give voice to survivor issues and concerns in local communities to engender a positive attitude toward survivors. They facilitate sessions in schools and madrassas on safe migration; conduct interactive meetings with journalists, local government and civil society organizations; provide leadership and facilitating training to members and other survivors; and promot human rights, women’s rights and safe migration days in their communities. In July 2012, the groups convened a Survivors’ Convention, at which approximately 100 survivors from around the country shared their concerns and expectations. Attendees created a document to be presented to policy makers, civil leaders, program planners/managers, media, legal experts, and service providers, including communities. It includes demands for rights relating to survivor-friendly prosecution, psycho-social empowerment, and integrated and standardized services for survivors. Moving forward, the Survivors’ Voice groups plan to advocate to communities and government to take sustainable action for the reintegration of survivors and prevention of trafficking and re-victimization.